‘Rebuilding Ireland’ is supposed to fix the affordable-housing crisis. Hereʼs why it will not. The common construction industry mantra says that if we increase the supply of new homes, then sales prices and rents will fall. The Department of Housing, Planning, Community and Local Government (DHPCLG) says that 15,000 new homes were completed in 2016 and housing supply increased by 18%. Home prices are up 8.6% in the past year and are predicted to rise by more than 10% in 2017. Residential land prices have increased 15% in the past 12 months. Emergency rent caps above the current rate of inflation have been introduced to mitigate 13.5% rent increases per year. 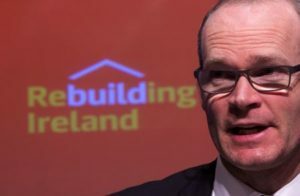 As Taoiseach Enda Kenny said in the Dáil in March last year, “Unless we address the barriers to housing supply, we are simply displacing one family in distress by another.” This article attempts to provide a critique of basic market assumptions that underpin government policy and the lack of valid new-home supply data. I apologise for the length, but I’m afraid it is necessary. Bear with me here; we need to talk numbers. Increasing new home supply does not reduce prices. 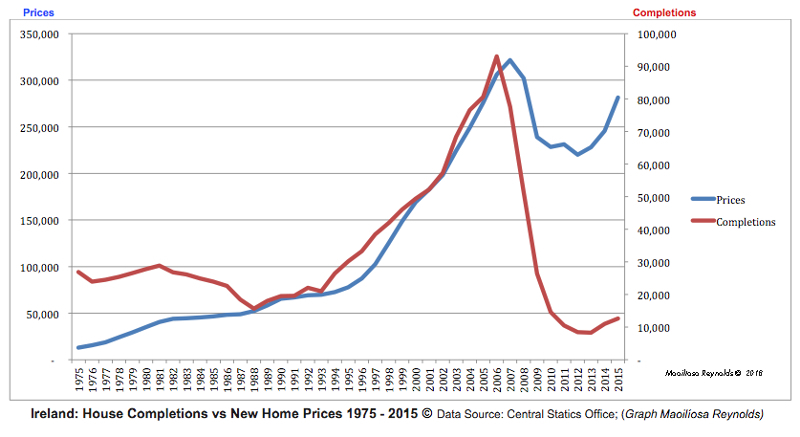 The graph below is compiled from Central Statistics Office (CSO) data and shows that monthly new-home completions and monthly average new-house prices from 1975. 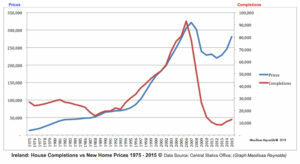 The graph shows that increasing house supply has not reduced home-sales prices in forty years. Price increases lead supply one year later. This is consistent with the idea that rising prices make development commercially viable: commencements ensue, but completions donʼt follow until a year later. Correlation is strong at 0.58 (above 0.5 and up to 1 is considered to be ‘strong’). However, there are other drivers of demand not shown, such as net migration, obsolescence, household formation and interest rates. Increased supply is unlikely to solve the affordability problem. Put simply, increasing new home supply does not reduce rents. 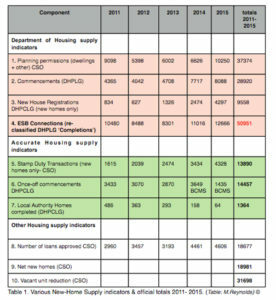 The following diagram compares new home completions (CSO) to Private Rental Tenancies Board (PRTB) leases for the last ten years (pre 2008 PRTB data is not available). Completions are for new Dublin 1-3 bed dwellings. The graph shows that increasing new homes supply has not reduced rents in ten years. From these – admittedly somewhat crude – graphs, it appears that increasing private-sector housing supply does not improve affordability for purchasers or those in the rental market. It’s more of a housing affordability crisis, as new developments are predominately in the €300,000+ price range in Dublin.The graph shows that increasing new homes supply has not reduced rents in ten years. Falling rents have led falling new home supply levels. 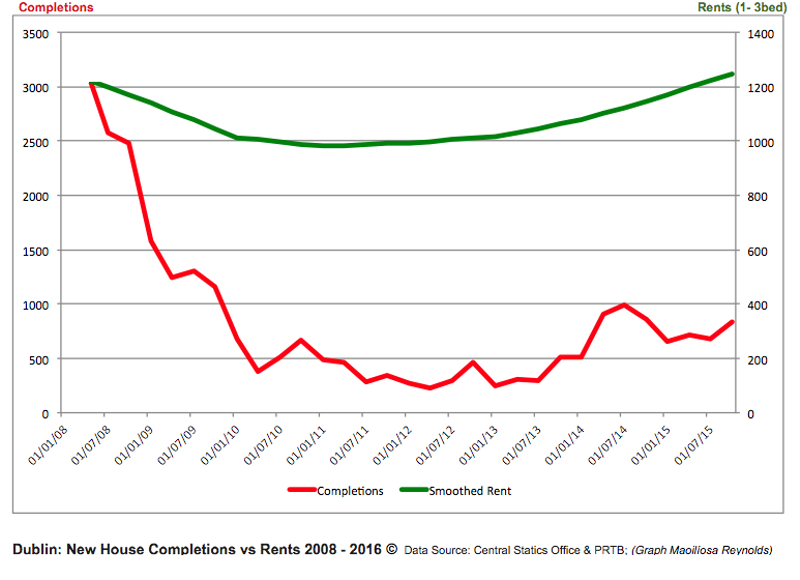 More recently, the recovery in new home completions is being led by increasing rents. There is a very strong correlation (0.86) between rent levels and supply levels with rent leading by one year. Increasing rents may encourage supply because commercial development will have a better return. Here are four that are currently quoted by the Department (and one that is not published). Planning permissions: Up to 40% of residential planning permissions do not get built each year. This is due to variety of factors: lack of finance, re-applications, value-add exercises and also land-hoarding. As such planning permissions are not a valid indicator of new build activity. BCMS commencements: The Building Control Management System (BCMS) electronically records all building commencements nationwide since 2014. Once-off commencements are an accurate indicator of individual house completions one year later. However, in larger multi-unit schemes, established practice is to lodge one commencement notice for an entire scheme or phases of a scheme that may not be completed for several years. As a result, overall commencement levels are not a valid indicator of new build activity in a given year. Registrations: House registrations are private warranty schemes made primarily for ‘estate homes’ built-for-sale on commencement of individual phases. They are only recorded at the start of a development and have the same problems as the BCMS commencements (house registration completion figures are not published). In the period 2011- 2015 there were 9,558 new home registrations, confirming the early phases of development on many large development sites. 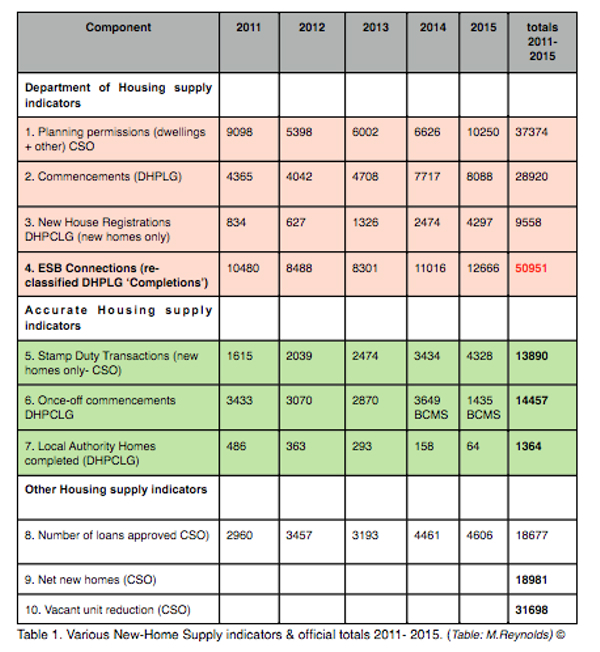 ESB re-connections data: The ESB counts electricity connections and the Department of Housing re-classifies these as new home ‘completions’. When a property has been vacant for two years, the ESB network requires the property to apply for a new connection and the old meter number (MPRN) is cancelled. In a typical year, some 25,000 MPRNs are cancelled and up to half are residential (source ESB). As a result, thousands of NAMA vacant completed units, completed ghost-estate units and local-authority refurbished voids are classified by the Department as new-home completions when re-connected to the grid. Analysis suggests over 21,000 vacant existing units have been double-counted as new build completions from 2011-2015. The actual level of new builds was 29,700 for the five-year period, some 42% lower than official house completion figures published by the Department. 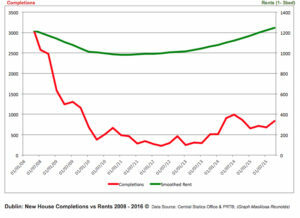 BCMS completions: The most accurate indicator of new home building activity is new home completions. Since the introduction of the BCMS in 2014, building completions are recorded on an accurate database. In September 2015, the system was revised with the introduction of SI.365, an opt-out for ‘once-off’ dwellings and refurbishments and included local authority buildings. The BCMS provides the Department of Housing with accurate real-time numbers for new ‘estate home’ completions in the BCMS database. These figures are not published. The Department instead relies on new ESB electricity connections as a basis for ‘completions’, despite the known multiple flaws. Stamp-duty transactions: In the absence of BCMS completions figures, new home stamp duty transactions (executed) are the best indicator of new ‘estate home’ completions. Some completed homes remain unsold from year to year, but these will balance (margin of error 2%). BCMS ‘once-off’ commencements: BCMS commencements for ‘once-off’ homes are accurate. It is assumed that no once-off homes are built-for-sale. The total number of new ‘estate’ homes sold (stamp duty transactions) last year was 3,606. The ten-month total for BCMS ‘once-off’ home commencements is published at 3,272 to October . The terminology used is misleading and the extent of double-counting existing units is significant. Department-termed ʻcompletionsʼ are the total number of additional homes including new builds, vacant units re-connected, local-authority homes and voids refurbished (public and private sector). This may be a reliable statistic, but it is not valid when used as an indicator of new home-building activity. There is no breakdown for new-builds although this is available. Revised Part V requirements (of the Planning and Development Act 2000) for social housing allow units to be leased long-term: there is no obligation on local authorities to purchase. Some 3,606 ‘estate homes’ were sold last year and, as a result, fewer than 400 Part V social homes may be provided. ‘Housing 2020’, which was launched in May 2014, allocated €3.2 billion and promised 25,000 social homes in five years. New home supply was to increase to over 20,000 this year. In the following two years, some 200 additional local authority homes were built. ‘Rebuilding Ireland’ details were confirmed in the Dáil on 17 November 2016: some 47,000 new social homes are promised with 32,000 to be leased or rented. One-and-a-half thousand ‘rapid’ units and a maximum of 2,200 Part V leased units will leave the the remainder of 15,000 to be new local authority builds, PPPs, voids refurbished, regeneration and ‘approved housing body’ builds. The Department’s ESB connections methodology suggests a real target of half this figure. If ‘Rebuilding Ireland’ sounds familiar, it is. We appear to be recycling homes and housing policy. So, where do we stand? The Department of Housing is smart enough to know it has a problem. ESB re-connection data has been used since the 1970s and has regularly inflated new home completions. This distortion has been more pronounced in the post-property-crash period. ESB-based ‘completion’ figures are effectively ’reliable but not valid’. The official response may be to issue a monthly completions update. The Department may continue to base ‘completions’ on ESB connections and thousands of re-connected existing vacant units will be double-counted in official figures. Commencements and planning permissions may still be quoted as indicators of new-build activity. Recently, a ‘Rebuilding Ireland’ update increased the official 2016 ‘completion’ figure to 14,932 when the actual building of new homes is considerably lower. This matters because market analysis, Government policy, housing targets and the national accounts and local-authority resources will continue to be based on methodology that is flawed and figures that are significantly distorted. In 2016 the number of new home sales was 0.0018% of total existing stock of 2,022,098 dwellings. Only one in ten first-time-buyers, 874, purchased new homes- most purchased second-hand homes (source: CSO). Even if new home supply doubled most first-time-buyers will continue to buy second-hand dwellings. For every 10% increase in a home’s sale price, land values increase by 35% (source: Savill’s Development Land Report 2015). Pro-cyclical Government policy has generated extraordinary windfall profits to land-owners and little incentive to assume development risk and build-out sites. Land-hoarding is a market feature. It appears to be more profitable to wait, to sell or engage in speculative planning applications than build homes. Over thirty years, renting a typical private dwelling costs the State €233,023 more than building a local authority home. Build a nZEB local authority home and the saving is €273,391. ‘Rebuilding Ireland’s’ strategy to pay private landlords for rented dwellings will cost the State €8.74 billion more than building nZeb local authority homes. This is an additional cost to the Exchequer of €291 million per year. At the end of the term, the landlord retains the title, and the State continues renting. The trend for increased supply of new homes may continue. Rising prices will impact affordability. Access to cheaper and more credit will accelerate the process. There are some solutions: vacant units. A step towards more affordable housing would be to target vacant upper floors and buildings and simplify the regulations that apply to existing building alterations. The country has twice a ‘normal rate’ of vacant dwellings in the State, with 198,358 homes that are unoccupied. This figure excludes vacant floors above shops (source: CSO). A Ministerial review of Planning and Building Control Amendment Regulations SI.9 of 2014 (BCAR) should be undertaken without delay. The skills shortage in the construction industry has been amplified by onerous and ineffective BCAR procedures that have brought no consumer benefit and added significant cost and red tape. 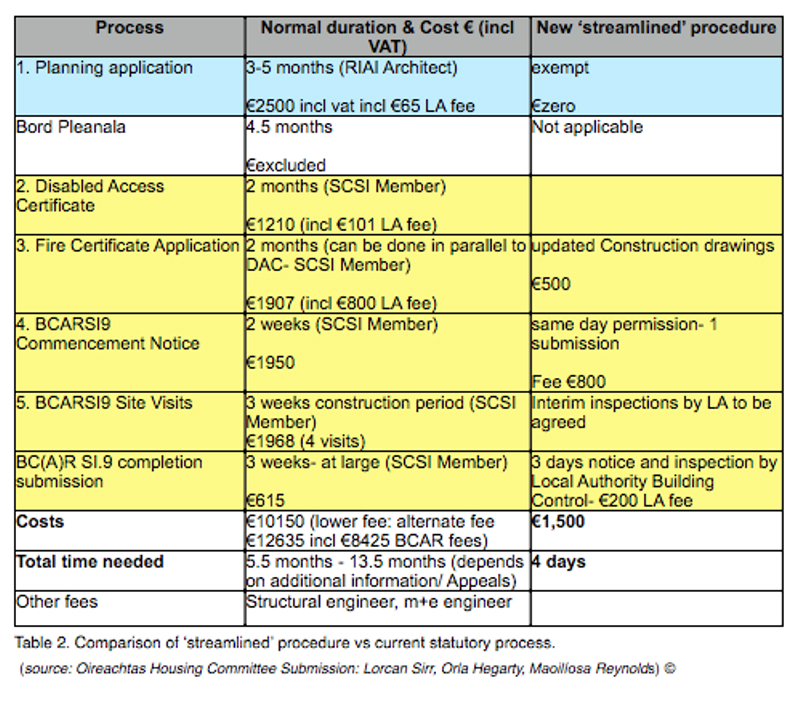 As an example from my own work a simple 35 Sqm suburban Dublin ‘change-of-use’ project requires three statutory permissions and complex building control procedures that take over five months and cost up to €12,000. 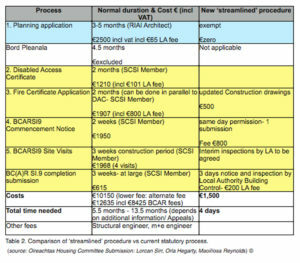 Building control costs are in the region of €7,650 and take 98 days. In the UK, similar compliances cost £675 and the process takes ten days. Building control is a significant barrier to feasibility. Unnecessarily complex regulatory processes could be streamlined to take four days and costs could be reduced by 85%. No primary legislation is required and this could be done immediately with three Statutory Instruments written by the Minister. This proposal is part of a submission made to the Oireachtas Committee on Housing in early February 2016. ‘Rapid’ homes are costing €245,000 each, excluding site cost. In contrast, a vacant unit can be brought back into habitable use at a fraction of the cost of new-build (from €20,000 to €90,000) and in a much shorter timescale (source: Peter McVerry Trust). Five vacant units can be brought back into habitable condition for the price of one ‘rapid’ build. This approach could revitalise our towns and cities and provide the interim supply measures to allow the new-build sector up-skill and grow in a more sustainable fashion. Vacant units are a win-win: they are cost effective, infrastructure is in place, are centrally-located and generate additional income and capital gain for owners. A recent study carried out by planning students from University College Cork study revealed that in a typical city-centre street with an existing population of 360 people, vacant sites could increase capacity by 375 persons (five vacant sites) and modest upper-floor conversions could increase capacity further by another 207 persons. Between vacant sites and vacant upper-floors, populations in urban centres could be increased by over 260%. In Dublin, this could translate into over 10,000 possible additional residential units within the canals. Longer term, local authorities need to examine more active market interventions. The National Planning Framework needs to actively target dereliction, vacant buildings and sustainable development and transport solutions. The solution to affordable housing is not on the periphery – it is in the centre of towns and overhead. This entry was posted in Building Regulations on March 23, 2017 by BRegs Admin.